Often times, leaders emerge from a meeting with an implicit understanding on who is more likely to stand firm on a disputed issue. How is that possible? Theories of International Relations often point to factors exogenous to an interaction itself (relative power, institutional constraints, norms and identities, a concerned public sphere, etc.) – rather than endogenous ones – that inform others of a leader’s resolve. The recent literature on face-to-face diplomacy also falls short because it focuses mostly on the psychological and neuroscientific dimensions of interpersonal interactions. In this paper, I build on the works of Erving Goffman, Thomas Schelling, J.L. Austin, Steven Pinker and others in sociology, psychology and linguistics, and present a microsociological theory of resolve projection. I argue that the time and space allowed for leaders to act and react are much circumscribed when they are in each other’s physical presence. As such, their proximity provides instantaneous information on whether one’s claim of resolve is believable, and on the other hand, believed. Such dynamics would enable leaders to, by the end of a meeting, converge on a “focal point” on how they will proceed on the disputed issue. I explain the “moves” that leaders can make to assert resolve, including the use of gestures, attempts to rhetorically coerce a counterpart into admission of fault, implicatures about his resolve, and threats expressed in the form of direct speeches and “undiplomatic” languages. To illustrate my argument, I provide an in-depth case study on the Kennedy-Khrushchev summit in Vienna in June 1961. 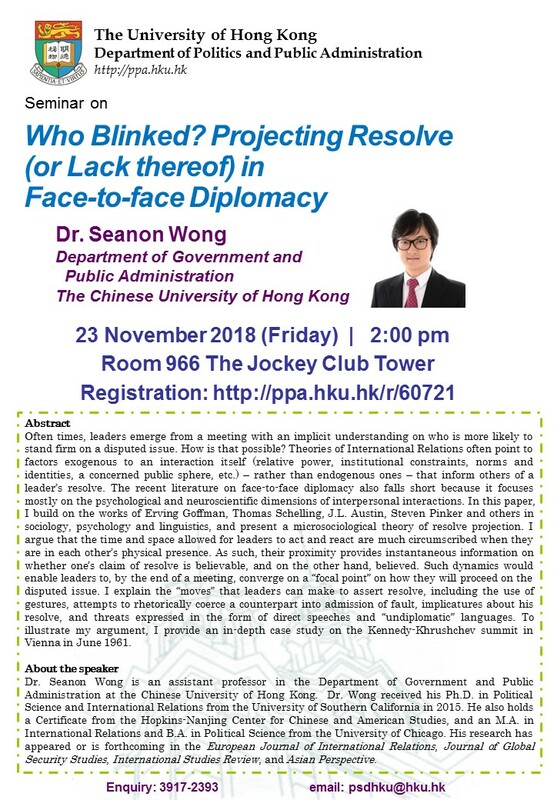 Dr. Seanon Wong is an assistant professor in the Department of Government and Public Administration at the Chinese University of Hong Kong. Dr. Wong received his Ph.D. in Political Science and International Relations from the University of Southern California in 2015. He also holds a Certificate from the Hopkins-Nanjing Center for Chinese and American Studies, and an M.A. in International Relations and B.A. in Political Science from the University of Chicago. His research has appeared or is forthcoming in the European Journal of International Relations, Journal of Global Security Studies, International Studies Review, and Asian Perspective.